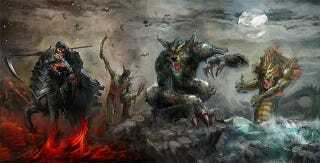 Ghosts 'N Goblins: Demon World was a new game up on Kickstarter looking for funding. Its developers said that they had "discussed" working with Capcom on securing the classic series' licensing. Capcom says nope, never happened, and has instead set the lawyers on them. The game's Kickstarter page has been removed and its campaign shut down, the Japanese publisher's US arm saying in its takedown notice that "The project admits it will need Capcom's permission to proceed and has not received one. To its knowledge, Capcom has not been contacted by the project."